Can Gemini men and Taurus women have a successful relationship that is compatible mentally, emotionally and sexually? The Gemini and Taurus sun signs are directly next to each other on the Zodiac chart. ‘Opposites attract’ is what is in store for a Gemini Man and Taurus Woman. Where the Gemini Man will be very adventurous and spontaneous, the Taurus Woman will have fears and worries about change or having to adapt rapidly to any new event. If a Gemini Man is willing to be patient with a Taurus Woman, she will be able to bring order to chaos which can sometimes be his life. With the constant shifting and discovering that a Gemini male likes to do, a Taurus female will look to be more grounded . The Taurus lady will be able to calm down the events in a Gemini Man’s life in order to gain a different perspective of the world. She is capable of giving a man true love and will always be willing to take care of her partner. The love compatibility in this Gemini man Taurus woman relationship will thrive on the ability of both to understand each other. The Taurus Woman is able to offer the Gemini Man true love and will have the patience to deal with all of his new ideas and adventures lifestyle. The slow habits of the Taurus Woman will eventually start to get on the nerves of a Gemini Man. She will want to take things slowly and would rather stick to her habits than try something new. She does not like change and has trouble adapting to a new situation. While the Gemini Man is very quick to act, likes to try new things, and accepts change as a challenge instead of a heart pounding crisis. Pretty soon, he will lose his patience and become very bored. The Taurus Women are very faithful and are capable of giving a man true love, but Gemini Men are very flirtatious. It would be likely that the Taurus female would become very jealous and will have trust issues while with her Gemini mate. It is simply in his nature to be the fun at the party even though he has no intentions of bring home another woman. The Gemini male would be willing to push the boundaries of a Taurus Woman, but she is the sign of the Earth. When the Earth moves quickly, only destruction follows. Sexually, this Gemini Taurus partnership can be a little complicated. If a Gemini Man is not willing to be patient with a Taurus Woman, then he won’t be sexual satisfied. She views love as an art where two bodies can be the paint brushes to a beauty picture. Venus does reign over the Taurus lady, so the possibility of a very deep, love relationship is possible, if only the Gemini Man is willing to be patient enough. He longs for passion and the heat of the moment. He may not be willing to wait for his Taurus lover to get in the mood. The Gemini Man might not be willing to give the Taurus Woman the faithfulness she deserves as he is constantly in search for a new challenge. She will also not keep him entertained for very long. She won’t be comfortable being forced to try new things or deal with his flirtatious personality. If these two star signs are not willing to work with each other’s personalities, then there is no use beating a dead flower with a stick any longer. Gemini is an air sign that is mutable and Taurus is an earth sign that is fixed by nature. 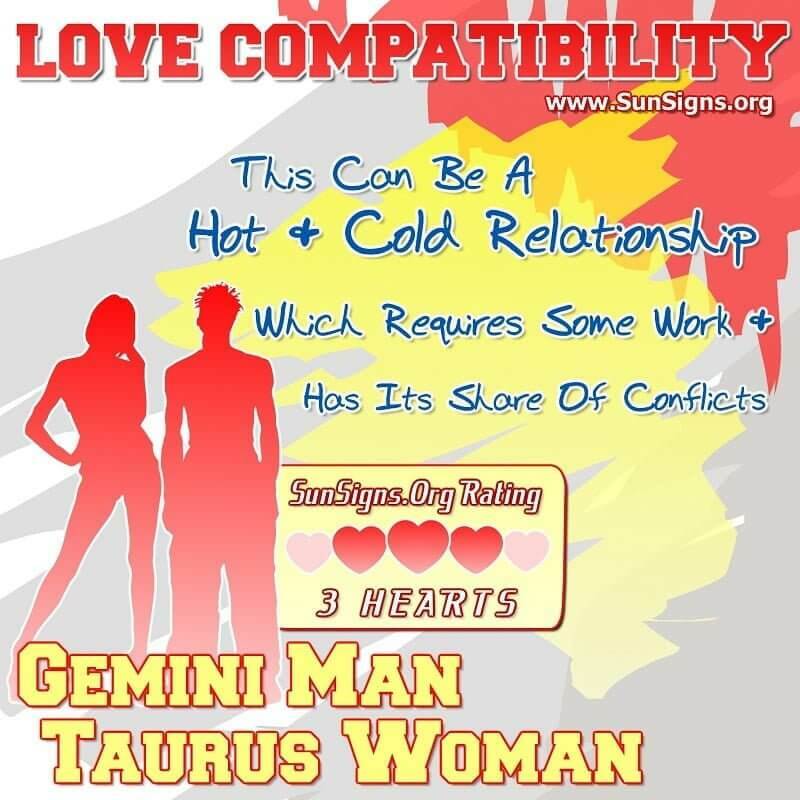 The Gemini man Taurus woman compatibility gets a THREE Hearts love rating. The differences of the Gemini and Taurus zodiac signs are what can bring stability to this relationship or simply tear it apart.